Enjoy the ease and charm of country style, no matter where you live. 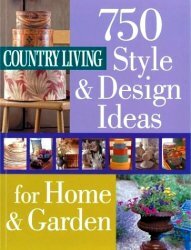 With 750 tips from the editors at Country Living, this far-reaching, sumptuously photographed book is your guide to every aspect of the good life. Country decorating is all about feeling comfortable and relaxed. The characteristic furnishings are not only appealing, but also practical. Hand-painted tile back-splashes add bright color to a kitchen and stand up well when exposed to cooking steam, while louvered shutters look inviting whether they’re closed to provide privacy or open to let sunlight in. Antiques are essential to this style for both their beauty and the history they evoke. Learn what to look for in the antiques that are popular with collectors. Detailing and size, for example, affect the value of whimsical chocolate molds. Be sure to consider the crispness of the colors and patterns on brown-and-white transferware.